I attended a weekend of memorial services with my dad. They were for a very beautiful 45-year-old woman who died from ALS, a most fast-acting and vicious disease. Stacey was someone I knew my whole life, but mostly from a distance. She had a sister, Megan as well. One of the services was held at the lake at a camp where she had dedicated a fair amount of her time, both as a camper, a counselor, and as an administrator. It was a beautiful venue for such a celebration of life. I listened to testimony after testimony as a very clear picture of her personality was presented. She was a life force. She was amazing. Her goal in life was apparent to anyone who knew her- make a positive change in the world, any chance, any way, any time you possibly can. She preached it and she lived it. She was adored and admired and most obviously successful in the impact she had on those around her. The last intimate conversation I had with her was several years ago when Tim was still alive. She said I was always her girl-hero because I was single for so long and managed to push forward with my life. I was pretty surprised by that opinion as I know how much I’ve detested being single whenever I have found myself in that state. Stacey said I gave her hope. She had met the love of her life, a super-cute guy from Ireland. He seemed as special of a guy as she was a woman. They were planning an engagement in the near future when he was found dead while fishing. Some totally unexplainable, bizarre event. I know she was devastated. I don’t know if she ever even dated after that, but she didn’t ever marry. She handled her loss with such grace and strength. And she was brave enough to stay single. She was MY hero. Then she gets hit with this hideous diagnosis. She has to quit work which was teaching in New York City to some of the most difficult population in this country. She moved to live with her sister. Megan worked full-time and had served with the Peace Corps in Africa. I went through the tedious process of applying once and got accepted. In the end though? Truth be told, I chickened out and never went. Megan is an amazing and brave woman as well. For 18 months, as ALS took over her body, Megan cared for Stacey. Day after day. And I discovered at the service that they never stopped supporting research and hoping for a cure. Wow, 18 months. I took care of Tim for five months and it felt like a lifetime. I can’t even fathom it. Sometimes I wonder what would be said about me at my funeral. While I listened at those services, I thought about how both of those astonishing women were and are everything I would have hoped to have been. I started out as a young adult aspiring to be a missionary. I wanted to change the world any way I could. I’m not saying I’ve been useless, but it’s amazing how far I have fallen short. Now most days, I just hope to survive the world another day. Megan, I know your heart is broken. And I know your strength will keep you from showing it most of the time. Stacey was lucky to have you. The love the two of you had for each other is rare. I would always listen with envy when you talked about the trips and adventures you would go on together. The weekend was about Stacey, as it should have been. The world will miss her love and influence and beautiful smile. But it was about you as well, the silent caretaker. Character is forged when unexpected, hard things happen to us. Again, I’m not saying I’ve done a horrible job, but the two of you put me to shame. You are both an inspiration to me. My thoughts and heart and love and every other thing go out to you. 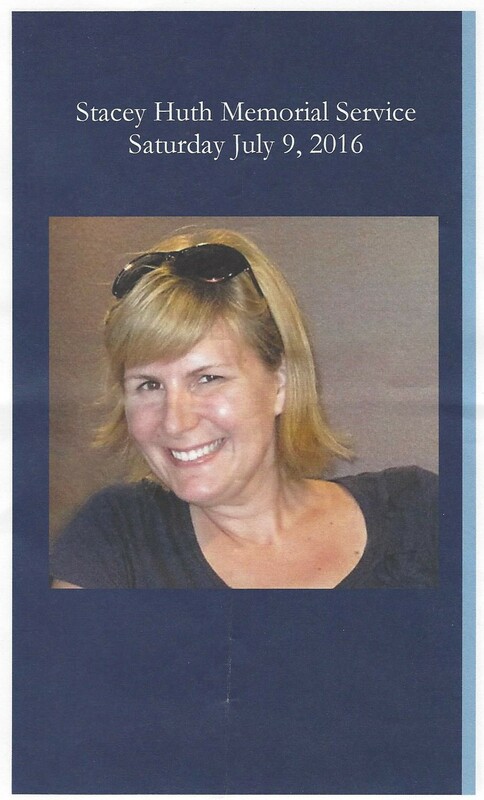 Categories: Grief & Loss | Tags: ALS, caretaking, memorial service, peace corps, stacey huth | Permalink. A beautifully written story of Stacey and Meagan. I miss you both so much.